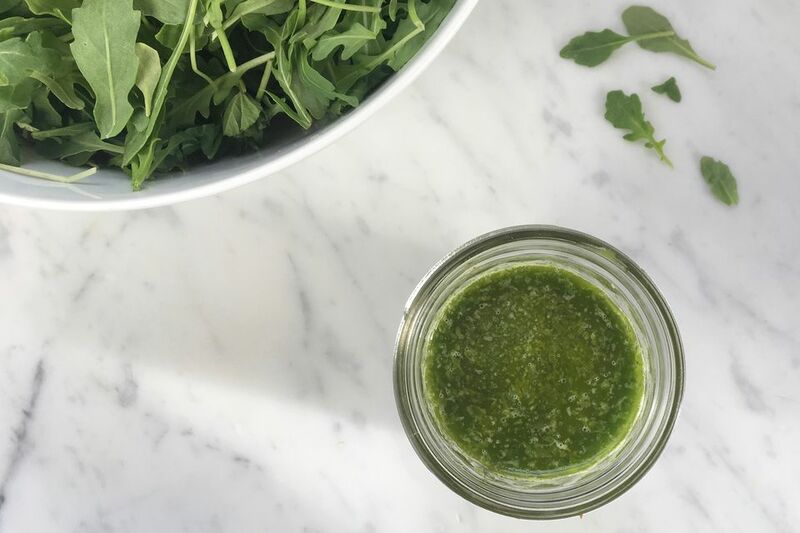 Fresh basil and just a bit of garlic are whirled into a simple fresh basil vinaigrette in this easy recipe. It's perfect on tomatoes, summer salad greens, or grilled meats, and is a no-brainer way to use an extra haul of basil from the farmers market or a prolific garden. It's actually pretty darn tasty on anything that comes off the grill or out of the garden—on a shaved zucchini salad or drizzled over grilled zucchini; tossed in corn cucumber tomato salad or spread on the bun of a simple burger; put on a Caprese salad for a twist or served with grilled salmon. The possibilities are as endless as a perfect summer day. See below (past the recipe) for tips on prepping the basil so that you can keep this dressing green even if you want to make it ahead. Rinse the basil leaves and pat them thoroughly dry. Put the garlic and vinegar in a blender or food processor. Whirl until the garlic is thoroughly pureed into the vinegar. Tear the basil leaves into pieces as you add them to the blender. Whirl to puree them into the vinegar. Use relatively immediately. The green of the basil will start to fade on any part of the dressing that sees air. Limit this by covering the surface of the dressing with plastic wrap placed directly on the surface (of parchment paper on the surface, with plastic wrap on the outside). While it comes to a boil, prepare a bowl of ice water. Add plenty of salt to the pot and dip the basil leaves in the water for about 15 seconds. Drain the basil and quickly transfer it to the ice water. Let it cool completely, lift out of the ice water, and squeeze any excess water out of it. Oddly enough, this process will help the basil stay much more green than it would otherwise.